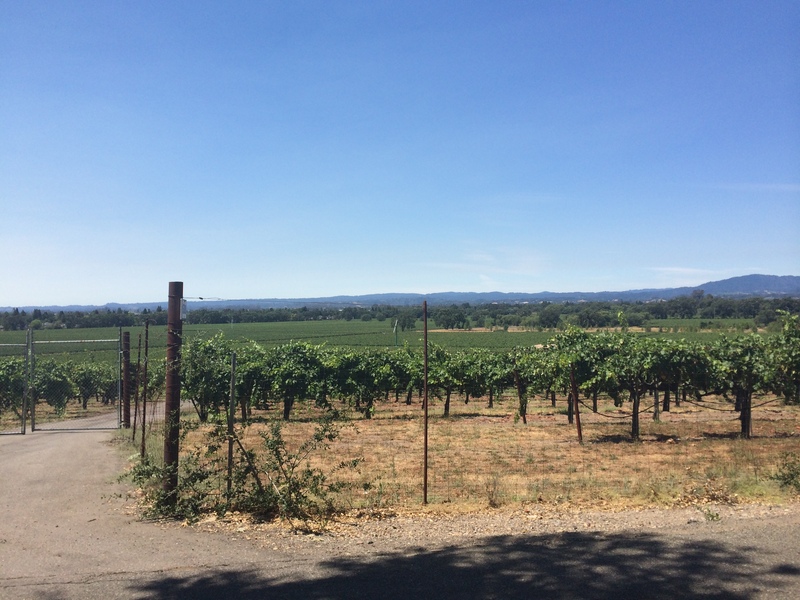 While Jesse was busy crushing Vineman, I set out to run 12 miles, a distance I thought would be a piece of cake given last weekend’s 20 mile run. However, with Jesse’s swim start at 8:36 am, and a forecasted high of 93 degrees, I knew a late morning run time would make for one hot run. I waited to run until Jesse left T1 post-swim; after that, I ate a late breakfast at Starbucks, checked out of our hotel, and was picked up and driven to T2 (and race finish) at Windsor High School. When Aditya and I finally started the run, the cloud cover had completely burned off and it was legitimately hot. 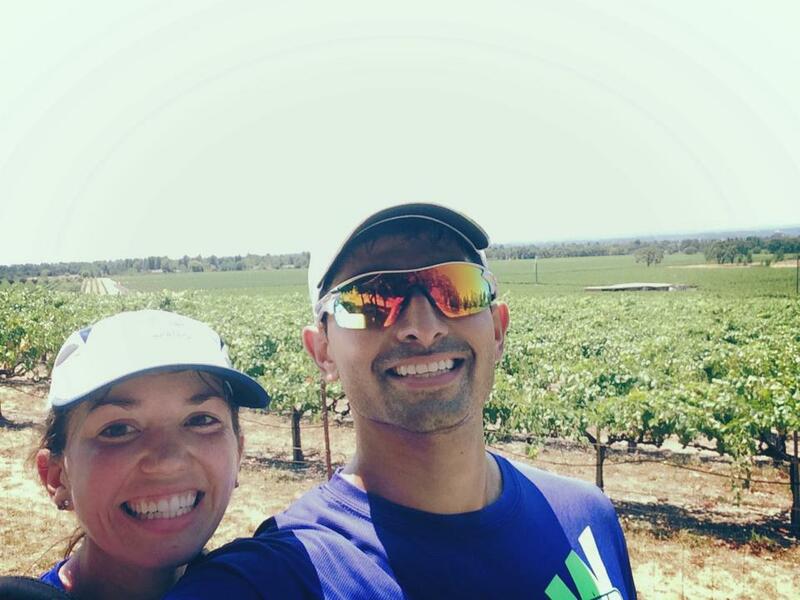 Aditya, a friend from Golden Gate Triathlon Club, drove up to spectate and join me for 12 casual miles. I couldn’t really believe how much I struggled through this run; 20 miles the week prior felt easier. I blame dehydration: rushing to meet Jesse at the swim start and cleaning up our hotel room didn’t force to me prioritize hydration. I’m also very bad at running in heat; running in perpetually 65-degree temperatures will do that to you. The whole time, I kept thinking that Jesse would be dealing with a run in these conditions AFTER biking 56 miles. I couldn’t complain! 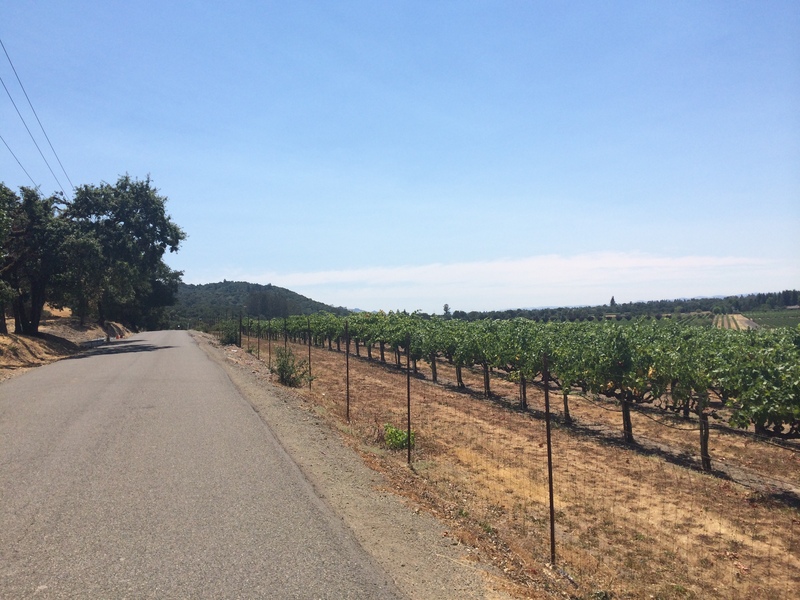 During the run, our route crossed paths with Vineman participants finishing the bike portion. Our matching Wildflower Olympic shirts were the same color as Vineman volunteers’ shirts – we were mistakenly thanked for our help several times! A slightly hilly portion. Also the end of the bike leg! I fell apart during the last few miles. When I start to feel really bad during a run, the top of my head tingles. I have no idea what this means or why it happens, but I take it as a sign that I’m in bad shape. With two miles left, we stopped at a park and I refilled the camelback. This definitely helped! Post-run, Aditya and I stopped at a store to grab coconut waters and protein drinks before rushing to the finish line. We somehow missed Jesse by what couldn’t have been more than two minutes, which was extremely disappointing, but I’m so happy that he’s happy with his time and the way he felt during the race. After grabbing his gear from the transition area and turning in his race wheels, we ended the afternoon with a delicious beer and pizza feast. Next up: a (hopefully) easy right miles! The San Francisco Marathon is 12 days away! I am bad in the heat too especially running! Good job for finishing! I am sure race day temps will be much better!! Wahhooooo…12 days to go!! Almost there!! That is exciting about the San Fran Marathon! Good training and luck! I noticed registration opened for The Big Sur Marathon in Cali this morning and has some staggered registration dates. Seems like an excellent race if I can get in! Yes! I really want to do Big Sur, it looks absolutely beautiful (but definitely not a PR, i think the course ma be more hilly than SF)! it was super hot out there on Sunday. i overheated for sure on the run. g’luck on your marathon. can’t wait to hear about it. Running in the heat is so hard. I can’t wait to hear about the SF marathon recap. Looks like such a beautiful course. It is a definitely an amazing (and hilly) course! I’m getting so scared with it so close! Ha, isn’t it crazy how one run differs so much from the next. So frustrating at times. I totally understand your challenge with the heat. As a Portlander, I too, frequently run in lovely, cool 65-ish degrees (and often make sure to run early on hot days to avoid the 90 degree heat waves!). I am nervous about my upcoming race in Southern Oregon – the Siskiyou Outback 50k; It’s longer than I have ever run, at elevation, and … it will probably be hot. So. yeah.